When someone dreams of living a long, happy life with the people they love, those aspirations do not include being sick and dependent. Yet the desire to live is innate even when life takes a turn for the worse. For people who have been blessed with financial independence, dealing with the implications of a medical condition that requires long term care can be very challenging. When faced with being dependent, knowing that one’s insurance coverage will give them choice, control and a sense of dignity will be essential to one’s peace of mind. For this reason, we believe it is important for our clients to explore whether their current financial structure and strategy will deliver these important outcomes in the event of a health care crisis requiring long term care. Long Term Care insurance has recently been restructured and re-priced and is now a viable option to protect what’s valuable through this stage of life. Most Canadians believe that government health care programs will cover the cost of their Long Term Care needs. As a burgeoning demographic gets closer to requiring care, there is a significant shortfall in funding. 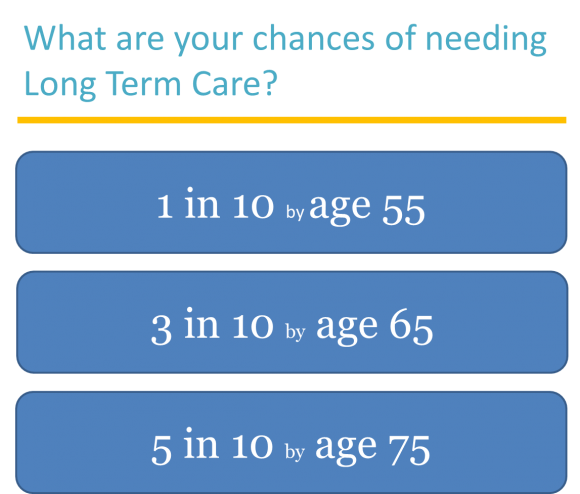 It is estimated that $1.2 Trillion will be needed to fund the long term care need. Current government funding will only cover half of this.